I tell myself "Don't let it get to me!" The more I do, the more they say. So they just keep on talking. Who do you think I think I am? I got the feeling that there is more like me. Born in Babylon but you just got to be free. So you need that key! "Man, if a distance is to me I could be mine." "Don't even think about steppin' out of line!" My friends are deep and they're all I've got. They stand up behind me if you like it or not. And I'm telling you that the fire's hot. Can you see that smoking? Did you hear that shot? 'Cause this is the war that in the middle I am. 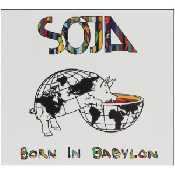 Estamos Escuchando Born In Babylon lyrics de SOJA Soldiers Of Jah Army con letra en este video de música online con en el video clip con estilo reggae y editado en (2009) e incluido en el disco ''Born In Babylon''. El tema "Here I Am lyrics" es el mas escuchado del CD donde puedes ver su letra y las canciones Top "Not Done Yet" ,"Peace In A Time Of War lyrics" ,"Here I Am lyrics" ,"Devils lyrics" ,.